Glen sweeps up the order of merit. Glen Moth picked up three wins in the season to come out tops in the Molly Grace, the clubs order of merit but it was a close thing in the end with Mike England giving him a good run up until the final event where glen saw his two point lead extended to nine. In the knockouts Mike Jarvis defeated Nick Mason to win the senior title whilst the Singles was contested between Terry Parsons and Paul Gardiner, after the first 18 Terry looked like he had an easy job being six up but Paul battled back to the final green only to lose by a single hole. Phil Perkins beat 11 year old Ashley Millington 5 & 4 in the Stranahan knockout whilst the double saw the ‘two Dans’ romp home 9 & 8 winners over Chris Terrington and Alan Tansley. Molly and Bendall were 7 up after the first stanza but lost first two holes of the second round, birdies and eagles were swapped but the match ended on the 28th. The clubs first team are back in Division 1 after a successful campaign losing just one match and taking the title with 17 points. Twenty-five players were used by the first team and with our elite players playing international and national events only Mitch Waite managed one appearance. The second team had a tough time but stayed up, hopefully next year World Cup interference will allow more players to select from. The thirds was a mixed bag with away wins and home defeats but they played with great spirit and the Millington brothers just got better and better, next year they will probably even play first team golf. A big thanks tour our captains, Nigel Gravelle, Kevin Hodge and Ali Young, their vice captains its a lot of hard work gathering the teams and thanks to all 52 players who represented our club. 5th Bunker gets a makeover. Work has started on the ‘sleeper’ bunker short of the 5th green. This bunker will be re-drained, lined and filled with fresh sand. It will also be visible for the second shot as we have removed some ground between it and the fairway. The path will remain but the right hand bunker will be a mound. We are very pleased to announce that we will be hosting Stage 1 of the European Tour Qualifying School on September 11th – 14th 2018. The field will consist of between 100-120 players looking to obtain their full cards for the 2019 European tour, along with 7 other courses throughout Europe, 20-25 of the leading players will progress to stage 2 in Spain. The bunker between the 10th and 12th greens has now been grassed, this should provide easier golf for the mid-handicapper and still retain the difficulty for the single figure golfer. 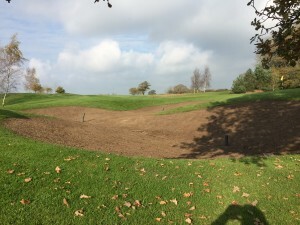 The catch bunker on the 15th fairway has also been grassed, it has been re-shaped to provide a level surface for the player when dropping a ball from the hazard to the left. We hope these will be in play by late April. Gordon Brand Snr Funeral Arrangements. Gordon Brand Snr, will be cremated on Thursday 1st February 14.30 at Haycombe Crematorium, Bath BA2 2RQ. Afterwards at Knowle Golf Club. The greenstaff have been busy this last week on the latest phase of bunker changes inline with our plans, the bunker between 10 and 12 will be grassed. We believe this retains the challenge for the good player but makes things slightly easier for the mid range golfer. The turf will be harvested from the next project which will be the 5th hole. We intend to expose the sleepered bunker that is currently hidden by exposing some ground in between, the spoil will be used to fill and grade the old right side part into a mound. Also shortly we are grassing the fairway bunker at the 15th. Most of you will be aware of the recent passing of John Base. John was a member pretty much from the start and regular supporting all the competitions until about two years when he was diagnosed with Cancer. John sadly lost his fight on September 18th and it was a great shock to us all. Our thoughts go out to John’s family. The funeral is at Westerleigh crematorium Friday 20th October 11.45 with the wake after at Stanshawes, Yate.